Beautiful Forms & Simple Detailing from Noel Brannelly Kitchens. The tiniest of rooms can seem more spacious with good design and in a home space is a highly desirable luxury. Upstairs Downstairs visited one of Noel Brannelly Kitchens to see some of Noel’s clever use of space. This kitchen has solid a solid timber units hand painted from Farrow & Ball paint range. Colour, whether a subtle ivory or vibrant crimson, brings life to kitchens. All Noel Brannelly kitchens can be painted, whether in part or in their entirety, in different shades and hues. They tailor to suit each of the client’s measurements. Tall, hand painted cabinets with feature bespoke internal storage. Here is a sample of some clever use of space in a Noel Brannelly Kitchen. Pull out dish drawers from Fisher & Paykel. A key cupboard, the drawers behind this cupboard only allow a shallow space where Noel cleverly designed a key cupboard. A shallow shelf perfect for books. Solid dovetailed drawers varying in depths for cutlery on the top with the pots in the bottom. Another ingenious use of small space, home for two solid timber walnut trays. A circular solid walnut breakfast bar sits neatly on the side of the solid hand painted timber island. Traditionally houses from this period were painted in ochres, umbers, creams and fawns. White wasn’t used much except for the window sashes on the simplest buildings. The out buildings were painted white using lime washes. Wallpaper was introduced towards the end of this period and it became quite popular. Luxury and wealth was indicated by the use of deep dark colours in the larger homes and thus this home used heavy dark colours with the wallpaper and drapes which exuded opulence and luxury. This house was operating as a rather expensive Bed & Breakfast and the decor reflected this – with deep brocade wallpapers and strong deep colour schemes in all the rooms. 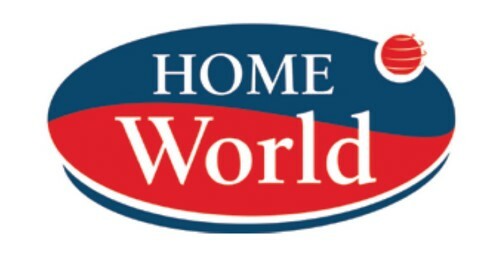 When Donal was hired, his brief was to completely change the colour scheme of the whole house, but he also had to retain its old world period look. He also had to take into account the antiques that were dotted throughout the house. The house also had some rather expensive modern pieces of furniture that could not be ignored either. His strongest memory on entering the house was the deep red in the hall and the strong yellows in the bedrooms. Many of the rooms were wallpapered, in keeping with the decor of the period and Donal had to keep this in mind when recommending a paint colour. Because the paint colour he was painting over was so dark he had to go for a high quality paint, in order to avoid putting on endless coats of paint. He was instantly drawn to the Farrow & Ball range using their ‘neutrals’ colour palette. This colour palette would give the house a fresh new look but would also blend with the antiques and the modern pieces of furniture. 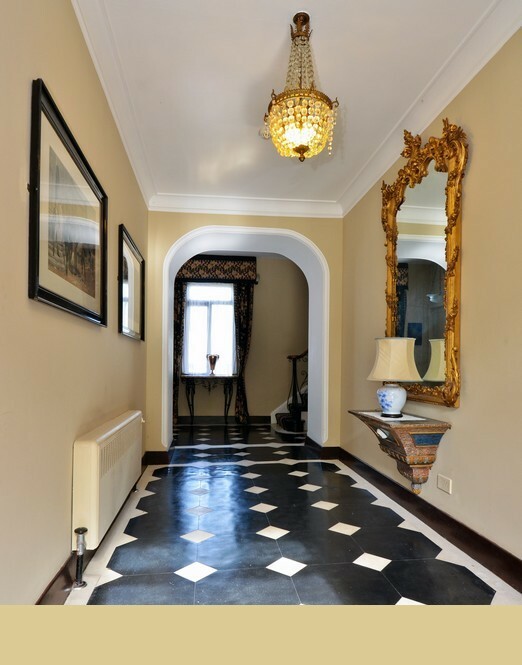 As you enter the large hall you are struck by the very striking floor tile in black and white, also a large gilt edged framed mirror makes a striking statement. Donal decided on the subtle shade of ‘Savage Ground’ from Farrow & Ball. It would be perfect for the eye-catching hall, so as not to take away from the strong highly patterned floor tile and the very ornate chandelier. The room on the left is what would have been know as the drawing room during its B & B days – this room leads into another room through two small arches. It will more than likely be used as a breakfast room as two doors lead out to the wonderfully manicured gardens. Both rooms are floored in a traditional mahogany herring bone timber. Donal chose ‘Bone’ from Farrow & Ball here giving a slight hint of colour to these elegantly decorated living rooms. 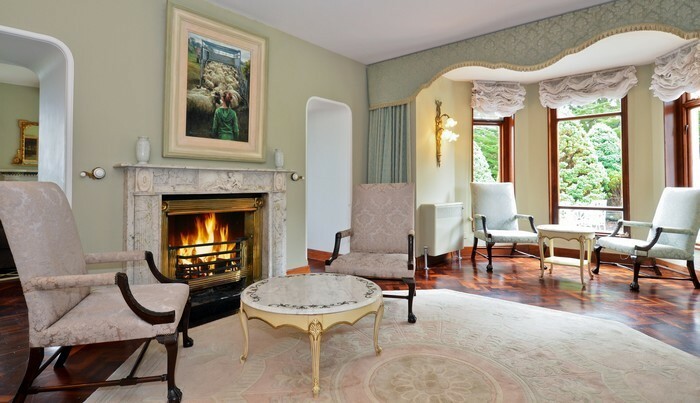 Ornate marble fireplaces sit back to back bringing atmosphere and warmth to both spaces. The large wide hall is continued under an arch to the main staircase. The black and white floor tiles ensure a continuity of both spaces and are matched with a custom made carpet on the stairs. The black of the carpet is broken up with a blue and salmon colour pattern, it was decided to continue with the same ‘Savage Ground’ paint choice of the hall. This was also continued up into the landing where the carpet runs along the landing covering the dark timber floor. A large tapestry rug hangs in this area and again standing out beautifully while also bringing out the best of the paint choice.The wrought spindles and bannister are fantastically highlighted by the backdrop of the ‘Savage Ground’ shade. 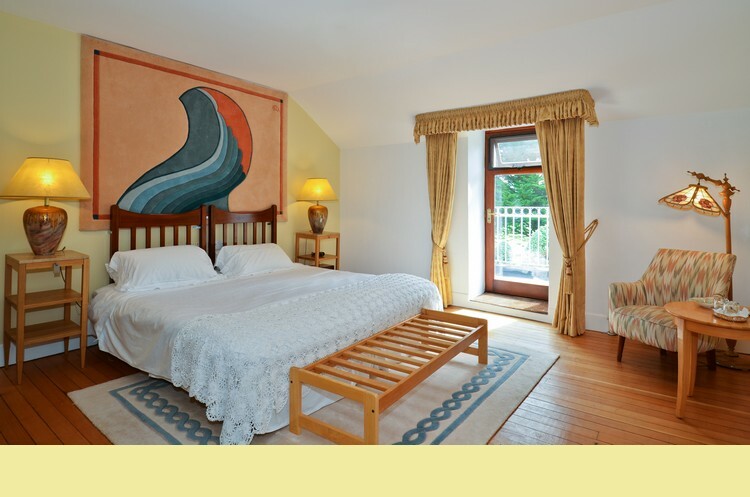 Each room had its own label according to its decor, we picked two to show you – The Art Nouveau Suite – obviously because of its more modern decor with a large Art Nouveau rug hanging above the bed. Donal, in keeping with this modern theme, went with Farrow & Ball’s ‘Cream’. Although he could have gone for a stronger shade here he decided to have no jarring colours in the house and played it safe with the neutral tones. The Regency Suite, Donal decided, deserved a regency style shade so he went for Farrow & Ball’s ‘Clunch’. The white french style bed blended extremely well with the subtle tone of this colour. The large ornate gold mirror reflects the shade and colour of this very elegant bedroom. Although Donal had no work to do in the bathroom, we thought it would be worth showing you anyway. Fully tiled with a large free standing sink, this room is the epitome of luxury. It was used as the en suite for the Regency Suite and is accessed via a walk through wardrobe. As Donal walked us through this beautiful home, now freshly painted, I was only sorry it had stopped trading as a Bed & Breakfast as I could only imagine staying in this period home and wandering though it, dreaming of its glory days as a grand home. The lives and the family who lived here will forever be just stories in my head. 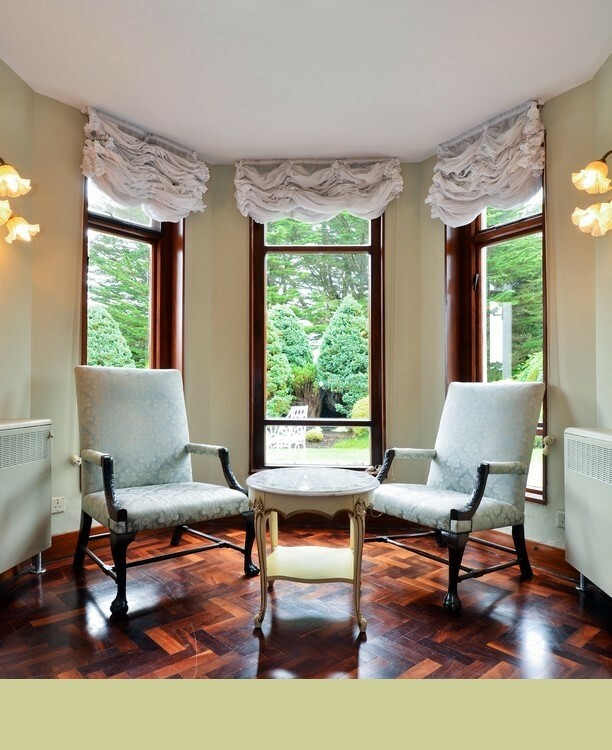 Donal Hegarty has truly done this grand old home proud – his choice of paint colours and the expertise with which he executed its make over has enhanced it and turned it into a beautiful family home. Do you like this story? We have loads more in our Magazine!